I had fun using up all sorts of leftovers that were sitting on my desk so this card had quite a mix of things thrown at it! The base card is Cherry Cobbler followed by an edge of Gold Foil Sheet (I always take the middle out to use later!). 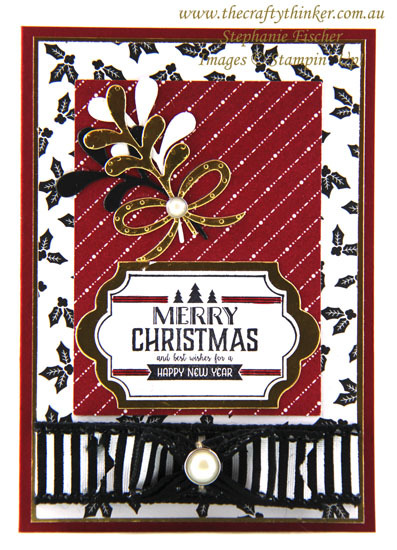 The next layer is one of the cards from the Memories & More Merry Little Christmas pack which I trimmed down just a tad. I'm having a giggle as I sit here writing because, looking at the photo, I've realised that I forgot to mount the striped card (also from the pack) onto the piece of Gold Foil Sheet that I cut for it!